Below are common attributes associated to Fredonia Grape. Become a care taker for Fredonia Grape! Below are member comments regarding how to plant Fredonia Grape. No comments have been posted regarding how to plant Fredonia Grape. Be the first! Do you know how to plant Fredonia Grape? Below are member comments regarding how to prune Fredonia Grape. No comments have been posted regarding how to prune Fredonia Grape. Be the first! Do you know how to prune Fredonia Grape? Below are member comments regarding how to fertilize Fredonia Grape. No comments have been posted regarding how to fertilize Fredonia Grape. Be the first! 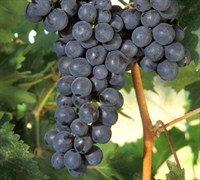 Do you know how to fertlize and water Fredonia Grape? Below are member comments regarding how to deal with Fredonia Grape's pests and problems. No comments have been posted regarding how to deal with Fredonia Grape's pests and problems. Be the first! Do you know how to deal with pests and problems with Fredonia Grape? In general, grape vines are not heavy feeders and do not need much fertilizer after they are well-established. Too much fertilizer can stimulate wood and leaf growth rather than fruit production. Moderate amounts during the first and second years after planting will help stimulate young plants to size up for earlier fruit production. First, you might want to have a soil or foliage test done through your Local Extension Service that can provide you with the type and amount of nutrients your soil may need for growing grape vines. Since you will be eating the fruit from your grape vines, consider feeding them organically. Organic-grown grapes will have outstanding quality because they have more natural resistance to poor weather or pestilence, and therefore tend to perform better. Organic vineyards choose organic methods to obtain the strongest and richest grapes possible, with the fewest detrimental effects on the environment, and their grapes reflect that dedication to quality. Incorporate a well-balanced organic fertilizer or compost into the soil at time of planting. Compost is especially beneficial to condition heavy clay soil that might retain too much water during the wet season and become hard as a brick during the dry season.